Summer is coming to a close, which means markets--both the farmers variety and the typical grocery store--are loaded with fresh vegetables. One of the great ones I find is particularly good from our farmers market is sweet corn. The corn that New Morning Farm sells in my neighborhood market on Saturday mornings is juicy and sweet and pretty affordable too. Although we usually enjoy it boiled on the cob, I've found a few other good uses for summer sweet corn. 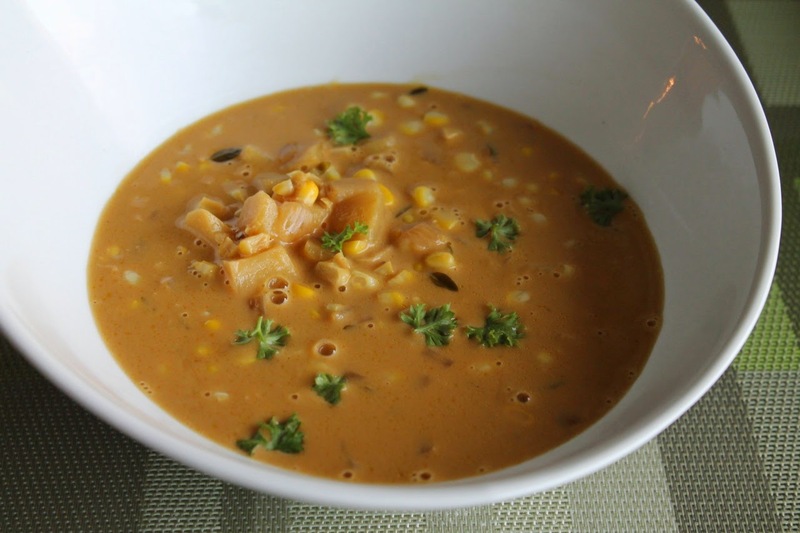 This chowder, for example, is a great way to enjoy is corny sweetness as a soup. This is a pretty simple recipe that uses potato to give the chowder body and onion, garlic and herbs for additional flavor. 1. Heat the butter and olive oil in a Dutch oven or other large pot over medium heat. Add the onion, garlic, and thyme and sauté until the vegetables have softened, about 8 to 10 minutes. 2. Dust the vegetables with the flour and stir to coat. Add the vegetable stock and bring to a boil. Add the cream and the potatoes, increase heat to bring to a boil and boil the mixture for about 7 minutes until the potatoes break down. 3. Cut the kernels off the corn cobs and add the kernels to the soup, discarding the cobs. Season with salt and pepper and simmer until the corn is soft, about 10 to 12 minutes. Serve in shallow bowls garnished with fresh parsley.